The SimpleFuel team, a consortium of The Fuel Cell Hydrogen Energy Association (FCHEA) members PDC Machines (Warminster, PA), McPhy Energy NA (Newton, MA) and IVYS Energy Solutions (Somerville, MA), has been selected as the finalist in the Department of Energy H-Prize competition and the team is proud to demonstrate its innovative solution starting in the end of September. This solution will provide a new fueling option for hydrogen fuel cell vehicles and enable a larger, more rapid deployment of these clean, zero emissions vehicles in the current and near future. As part of our partnership with Warwick Township and the local fire departments, Kareem Afzal (PDC) and Darryl Pollica (IVYS Energy) were pleased to conduct a fire safety training for over 50 first responders, fire departments and hazmat responders. Three companies were present including Warwick Township, Hartsville Township and Northampton Township (all PA). The Simplefuel team spent time at their first site at PDC Machines Plant 2 location in Warminster PA going over the principles of the system operation, first level fire safety with hydrogen and emergency procedures for the Simplefuel system and hydrogen FCEV. The response and support of Warwick Township and the first responder community has been invaluable to this project and the team looks forward to continuing the engagement. PDC Machines hosted a group of students from the Metalworking training program at Bucks County Community College. PDC Machines is a partner in the apprenticeship program sponsored by the NTMA (National Tooling and Machining Association). One of the many new products unveiled at ACT Expo 2016 is an on-site hydrogen fueling solution from SimpleFuel (Booth 1712). SimpleFuel comprises a team of three companies originally assembled to compete for the Department of Energy’s H2 Refuel “H-Prize” award: IVYS Energy Solutions, PDC Machines, and McPhy Energy. Team representatives noted that SimpleFuel is the only company remaining in the H-Prize competition after two down-selections, with the only remaining activities involving delivery on the metrics during a demonstration later this year. “It’s the combination of the abilities of the three organizations that ‘makes the magic,’” says Prabhu Rao, North American CEO for McPhy Energy. “So, for about the same cost of one large station, we can deploy between ten and 15 of these, avoiding the fuel anxiety that some customers have,” he said. Rao said that potential future applications include home fueling, workplace fueling, fleets and small retail stations. Asked about production possibilities, Rao said that the company is currently “building one for a customer” that will be delivered in September. PDC Machines will display a refueling solution at ACT Expo in Long Beach Convention Centre, 300 E. Ocean Blvd, Long Beach (CA) from May 3-5. At the clean transportation and alternative fuels tradeshow, PDC Machines and its consortium partners will present a compact and cost competitive SimpleFuel™ refueling solution for targeted fuel cell vehicle and material handling markets. 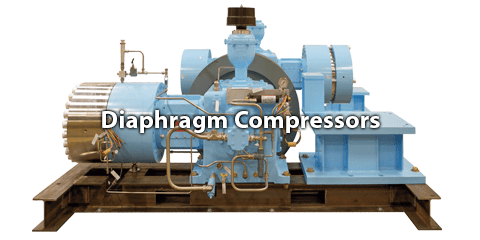 Warminster PA,– PDC Machines, a company specializing in hydrogen compression equipment for industry and energy markets, will present, SimpleFuel™ a refueling solution at its stand (No. 1712) at Advanced Clean Transportation (ACT) Expo, the leading carbon free-mobility event in the United States to be held in Long Beach (CA) from May 3-5. IVYS Energy Solutions, PDC Machines and McPhy Energy are collaborating in the development of the SimpleFuel™ refueling solution. This turnkey SimpleFuel™ refueling solution integrates on-site hydrogen generation, compression and dispense technologies in a compact footprint while ensuring safety and cost-effectiveness. The SimpleFuel™ product is targeted towards vehicle fueling markets such as residential, small fleets, work place, and service centres. In addition, the solution will also enable fuel cell material handling solutions to address the fueling needs of small distribution centres and retail stores. Kareem Afzal, Vice President, will represent PDC Machines at ACT Expo. PDC Machines showcased its new diaphragm compressor at the 12th International Hydrogen & Fuel Cell Expo 2016 at the Tokyo Big Sight, Japan, 2nd to 4th March 2016. After careful review of six submissions, an independent panel of judges for the U.S. Department of Energy’s H2 Refuel H-Prize selected Team SimpleFuelTM, which includes PDC Machines, as the finalist for the competition organized to develop an affordable small-scale hydrogen refueling system. Warminster, PA USA February 11, 2016 – PDC Machines- the world leader in hydrogen compression solutions for hydrogen refueling stations and energy applications- along with its partners IVYS Energy Solutions (Massachusetts) and McPhy Energy North America (Massachusetts), is part of Team SimpleFuelTM which has been selected by an independent panel of judges and safety experts to develop a hydrogen refuelling solution as a part of the U.S. Department of Energy’s (DOE) H2 Refuel H-Prize Competition. This competition was launched by the DOE’s Fuel Cell Technologies Office (FCTO) and the Hydrogen Education Foundation (HEF) in October 2014 to develop small-scale hydrogen refueling systems which can be used in homes, community centers, retail sites, or similar locations to fuel hydrogen vehicles. Such solutions will enable the broad adoption of hydrogen infrastructure across the country by providing another convenient fueling option for U.S. consumers adopting fuel cell electric vehicles. Team SimpleFuelTM will have until July 2016 to deploy their home scale refueling system and prepare it for testing. 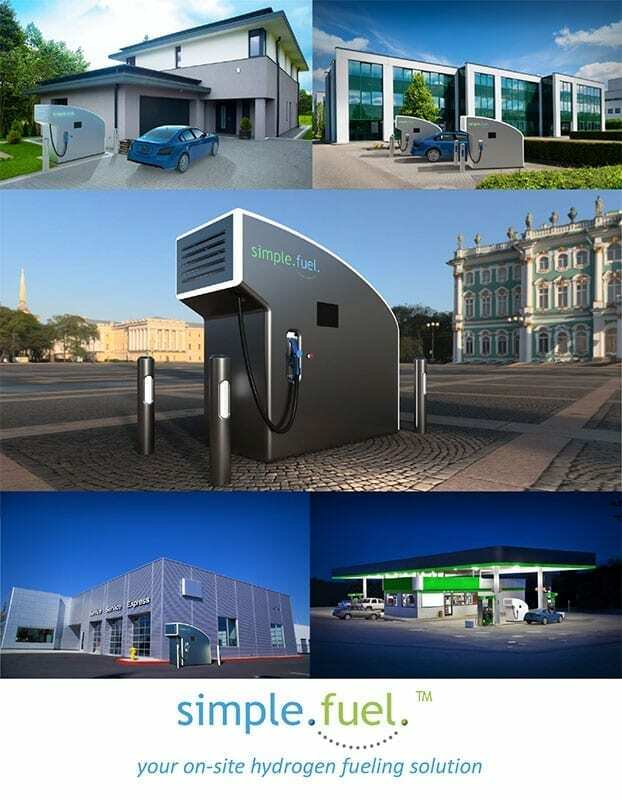 The SimpleFuel™ Home Vehicle Refueling Appliance is a fully integrated hydrogen generation, compression, storage and dispensing system capable of delivering up to 5 kg/day of hydrogen to vehicles at pressures up to 700 bar using hydrogen produced via electrolysis, with a design that minimizes setback distances and reduces its physical footprint. The project has been approved and permitted by Warwick Township and will be installed at PDC Machines Plant 2 location. 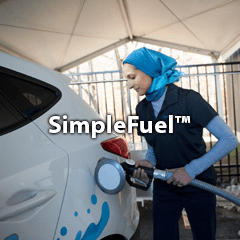 Data collection will end in October 2016 and will be used to determine if the SimpleFuel™ Home Vehicle Refueling Appliance meets the technical and cost criteria to win the $1 million prize. “We are very proud to be part of Team SimpleFuelTM that has been selected for the final stage of this competition. PDC and our partners are deeply honoured by the selection and to be a part of such a talented team. We look forward to the next phase of the competition,” says Kareem Afzal, Vice President of PDC Machines. 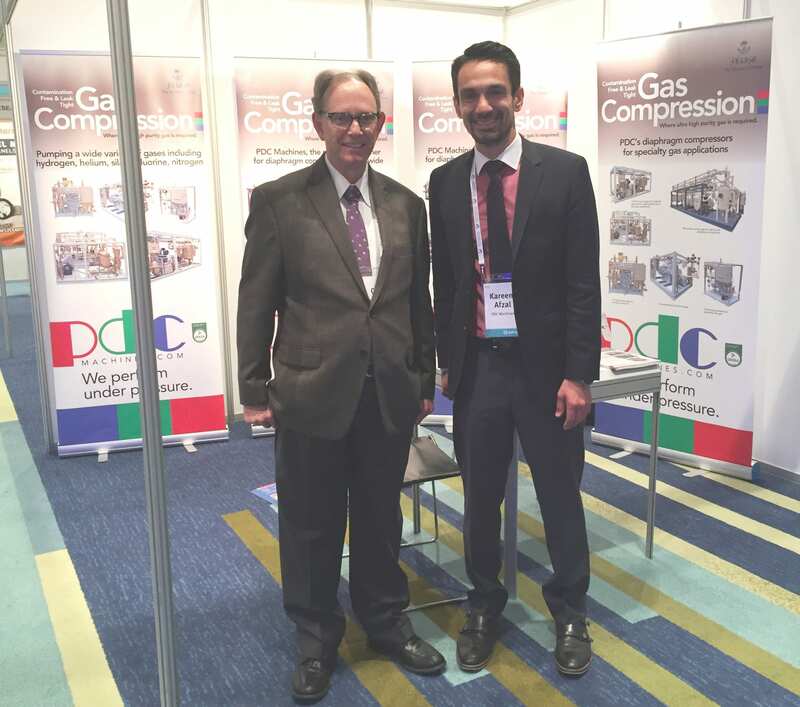 PDC Machines show cased it’s diaphragm compressor technology at the Middle East and North Africa Industrial Conference 7 – 9th December 2015. Shown above is PDC Machines Vice President Kareem Afzal and Cid Bacellar of Fiba Technologies. Congressman Mike Fitzpatrick visits PDC Machines, Inc.
On Friday August 21st, Congressman Mike Fitzpatrick visited PDC Machines. Congressman Fitzpatrick is a member of the Republican Party serving as the U.S. Representative for Pennsylvania’s 8th congressional district. During his visit, PDC highlighted its capabilities in supplying compression systems and it’s active involvement as a component supplier, promoting the growth of commercial hydrogen refueling stations. 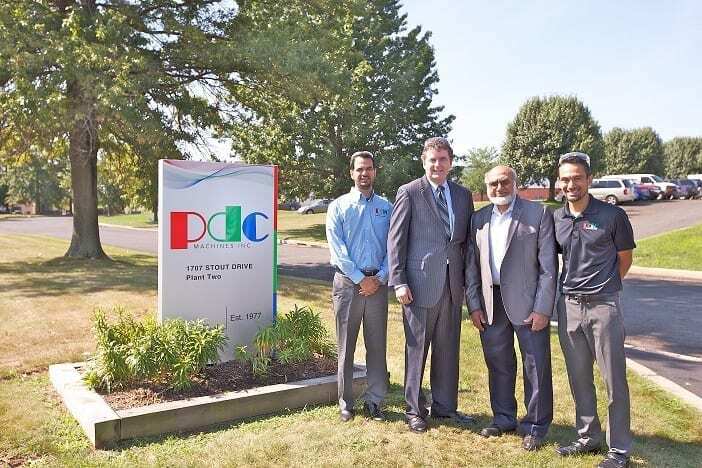 Shown above from left to right, Mateen Afzal, (General Manager and CFO), Congressman Mike Fitzpatrick, Syed M. Afzal, (President) and Kareem Afzal, (Vice President). Fuel cells generate electricity using an electrochemical reaction, not combustion, so there are no polluting emissions, only water and heat as by-products. Many fuel cells are fueled with hydrogen, which can be derived from a wide range of sources, both traditional and renewable. This includes wind-powered electrolysis, the process of running electricity through water to generate hydrogen and oxygen. Since a fuel cell produces water as a by-product, it can become a sustainable closed-loop system. The variable nature of wind lowers the efficiency of wind turbines, but fuel cells can provide base-load power that ensures a facility stays powered during times of low or no wind. In areas with abundant wind, hydrogen and fuel cells are becoming a viable energy storage option. Power-to-Gas (P2G) projects, where the excess electrical energy can be used to produce hydrogen, are on the rise in Europe, mainly Germany, and many incorporate wind turbines. The hydrogen produced via wind electrolysis can then be injected into existing natural gas pipeline infrastructure, or stored and used at a later time to generate electricity in a stationary fuel cell or used to fuel up fuel cell electric vehicles (FCEVs). Interest in renewable power generation, and solar power in particular, is growing quickly in the United States in both the residential and utility markets. Unfortunately, when the sun is not shining, in inclement weather or at night, solar can be a limited power resource. Fuel cells are the perfect partner, able to generate supplemental power if solar resources are low during the day, or by providing electricity at night. 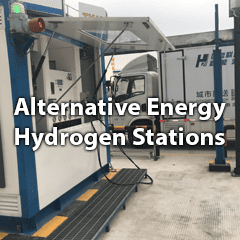 A synergy between the two technologies is further emphasized when using solar electrolysis to generate 100% renewable hydrogen that can be used for onsite fuel cell power generation or fuel cell electric vehicle (FCEV) fueling.